In previous generations, it was not uncommon to see dining room furniture that was rather large and ornate in design; the dining room was a focal point for many families, whether to sit together for all their daily meals, a traditional Sunday family dinner, or the celebration of religious observances. In the black-and-white movies of those times, dining room scenes often included tables of substantial size and length that comfortably sat 20 guests or more. As with many customs and traditions however, new trends can emerge over time. Furniture designs today have leaned toward smaller and less elaborate pieces, as lifestyles, personal styles, and home construction styles have evolved; this practice can sometimes be termed as creating a smaller furniture footprint, which refers to the amount of floor space required by or covered by a furniture piece or set. Main purpose of dining room – intimate meals or large parties? Guest comfort – will they have sufficient ‘elbow room’ or feel crowded? Although the basic function of any dining room table and chair set is to provide a means for the family to serve and eat meals, there are clearly numerous questions and deliberations to address in order to make that setting as functional and comfortable as possible. As such, if homeowners wish/need to furnish or refurnish their dining room, they would be well-advised to speak with a sales consultant from Carrocel fine furniture, located near the Yorkdale Mall in Toronto. Based on the homeowner’s input/responses to questions such as those above, the Carrocel representative will be able to suggest and present dining room table options that will best fit the available floor space and the personal needs of the family. When choosing the size of their dining room table, homeowners should not feel constrained in their choices but rather consider the wide range of options/possibilities made available by the Carrocel fine furniture specialists. 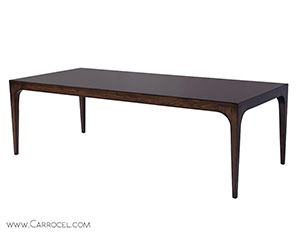 Carrocel offers an impressive array of dining tables, including a selection of one-of-a-kind pieces, as well as the flexibility to offer custom dining tables as a means of creating the specific furniture footprint to meet a family’s needs and available dining space. 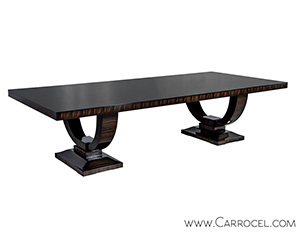 To select the ideal size of dining room table for your home and family, call the fine furniture experts at Carrocel today at 647-694-4683 or contact us to request your complimentary consultation. You are also invited to visit our 20,000 square-foot showroom, located at 245 Bridgeland Avenue in Toronto, to view and compare our fine selection of high-end dining room tables.